"Who could Ladybug really be? Why has she always kept her identity a secret? If I was her, I would be revealing it to the world. That would be basically working for nothing." Little did Alya and Chat Noir know that they both really wanted to know Ladybug's identity forever. Now, they take risks and opportunities. Start from the bottom to work your way to the top. 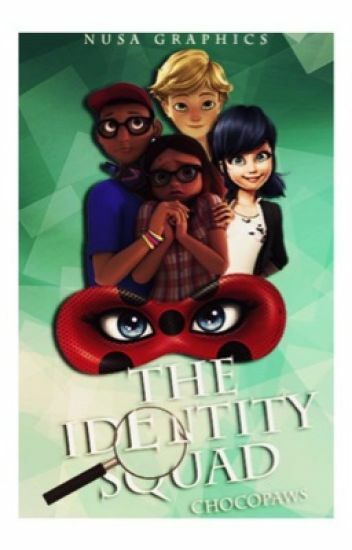 After Alya 'accidentally' finds out Chat's Noir's identity, they team up to see who Ladybug actually is. This would be later known as, Mission Identity Squad. Completed Officially: December 2nd, 2016. This story takes place in Paris,France. Meet Marinette, a kind and clumsy girl with a cheerful smile on her face. Her parents Tom Dupain and Sabine Cheng. She is just like any other teenage girl in the world. The three 'F's are her biggest priority as well as her huge crush on her classmate Adrien Agreste. Her three 'F's are fashion, friends and family. Meet Adrien, a charming boy with a tinge of shyness in him. Unfortunately, he was taught to be more serious, obedient and less lively than an average teenager due to his strict upbringing at home. But that doesn't mean , he doesn't let go once in a while. Each of them have a secret that they don't want anyone to know. However, as they always say secrets always come out in the end. This is my first fan fiction book so please don't judge. Also I'll follow the tv show but not completely. All rights reserved to the show. Please comment because I want to know your thoughts! I'm not going to ask you for votes, I just want you guys to enjoy, that's all. A new girl named Miranda is in Marinette and Adrien's class. She is one of Chloé's outside of school friend, so Marinette knew this couldn't be good. "Hi, I'm Miranda. I love Chat Noir just like Chloé loves Ladybug! Yeah, the duo is so cool but I'm like in love with Chat Noir!" Marinette is shocked to hear what Miranda had to say. I never knew anybody liked Chat Noir... Well that's a change... Marinette thought. Marinette thinks she won't be jealous. But let's see who is jealous... Besides her. So basically the school is under attack by the akumatized principal and Marinette does everything in her power to save the students. Adrien on the other hand grows suspicious because Marinette is acting just like ladybug. Lot of drama after that day. Read more to find out what happens! Adrien Agreste. the famous model who nearly every girl in Paris is fawning over. and now he's missing. marinette, of course, is desperate. and she'll do anything to find her lost love. but what will happen? Marinette Dupain-Cheng is crushing on a boy in her class, Adrien Agreste. She also happens to be Paris' super heroine, Ladybug. Little does she know Adrien is secretly Ladybug's partner, Chat Noir. When Adrien starts to see the similarities between Marinette and Ladybug(who he has a crush on), things get a little... Well,confusing. It was going to be a lovely trip to Japan, until the plane crashed. All of the adults, missing. How could it have gotten worse? They were stuck there for a week. Marinette happily swung her bag around as she raced to her school, along with Alya. She was going to have a class trip to Japan! And the best part was, she was going to be sitting next to Adrien! Marinette finally gains enough courage to confess her feelings to Adrien and ask him out on a date. Adrien being the nice guy he is and not wanting to cause another akuma accepts the invitation. He had had feelings for Marinette all along but they were never as strong as his feelings for Ladybug. Seeing as Ladybug wasn't interested in him he decided to go for Marinette. What happens on their date? What happens if they start dating? What will happen if certain people start to get jealous of Adrien and Marinette? Will they figure out their alter egos or will the be oblivious? Read the rest of this book to find out. It was the time of the year every student in College Francoise Dupont looked forward to. Concert season. Every year, the school would spend months to put up a major musical. Famous talent scouts would be littered around the audience. Every student dreamed to get the lead role. To celebrate the year Paris' most famous superhero duo arrived, the musical was about Ladybug and Chat Noir. It had quite a twist, turning it into a romance dance story.